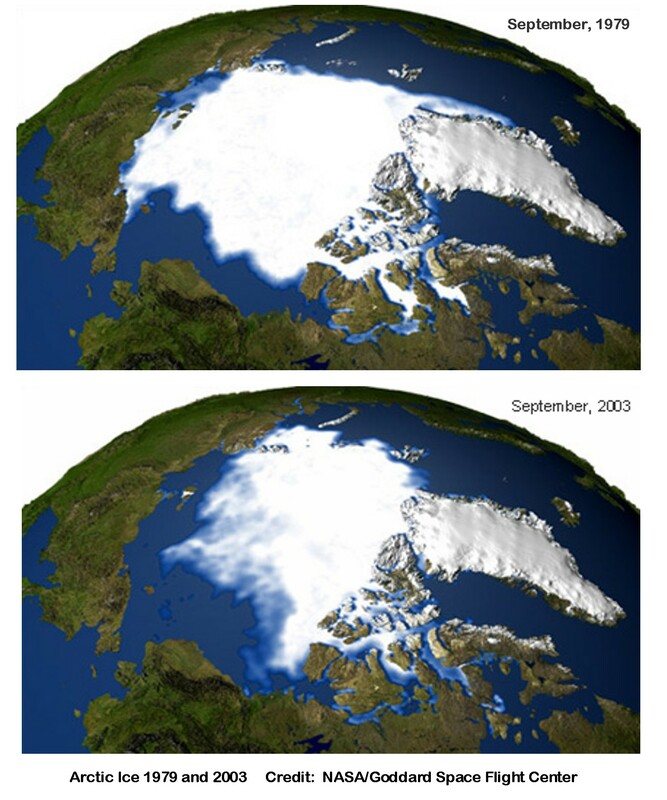 The September 2004 issue of National Geographic has pictures of the Polar region taken in 1979 and 2003, which shows that over that period, the extent of the polar sea ice had declined 30%. Polar bears, whose hunting grounds are the sea ice, now have to swim many miles to reach the ice – when in the past they could simply walk onto it. Dr. Monnett, who is studying the Polar bear population, counted four Polar bears who had drowned because they were caught in a storm trying to swim to the sea ice to hunt. He reported that incident in a paper on the declining habitat of the Polar bear, which was published in a peer-reviewed journal. However his survey report only reported on the drowning of three bears, because only three were in the survey area. That is a reasonable explanation for the discrepancy, however, it led to a controversy about him inflating the number of bears in his research article. Though that happened five years ago, the Interior Department has been put under political pressure to investigate the matter and they are doing so. As Sen. Inhofe wrote in his letter, “As ranking member of the Senate Committee on Environment and Public Works (EPW), I am committed to ensuring that scientific integrity is upheld in the federal decision-making processes”. If he really means that, perhaps he should wait for the investigation, which is hopefully being done by unbiased scientists under proper procedures, to be completed before jumping to conclusions. The Polar bear has become a symbol of all we may lose by failing to address our pollution problems adequately. The charges against Dr. Monnett are a politically motivated witch-hunt designed to punish scientists who disagree with Sen. Inhofe’s views on global warming. The polar bears were put on the threatened species list, not because of Dr. Monnett’s work, but because their habitat is clearly declining. As their habitat disappears, so will the Polar bear. It is something man should think about – as our habitat is deteriorating, also. This entry was posted on Monday, August 15th, 2011 at 8:20 am	and is filed under Climate Change, National Politics, Oklahoma Politics. You can follow any responses to this entry through the RSS 2.0 feed. You can leave a response, or trackback from your own site.